The full history of Rock Island’s Washington School — the grade school, not the junior high on 18th Avenue that we know today – is obscure. It was located on the southwest corner of 3rd Avenue and 13th Street. Our postcard, which was mailed in 1913, shows the school as it appeared in the early 1900s from the middle of the street intersection. It was published by the Rock Island Postcard Company, who added color to a photograph that first appeared in Picturesque Tri-Cities. Each issue of Picturesque Tri-Cities, which was published monthly for twenty-four months between 1902 and 1904, contained about eighteen photos of homes, businesses, and community leaders in Rock Island, Moline, and Davenport. Many of the building photos were reprinted and colored to create postcards such as this one from Shannon Hall’s collection. By 1857, the original school had been rebuilt of brick although it still contained only two rooms. At that time a total of 317 students were attending the Rock Island public schools. The school building on the postcard probably dates from around 1870, a busy time for school builders with many Rock Island schools being built or enlarged. As noted in an earlier Postcards From Home story, P. S. No. 1, later Hawthorne School, was constructed in 1868 and was a similar 2 ½ story building. Washington School was originally known as Public School No. 2 before being renamed in 1897. Sanborn Fire Insurance maps show that Washington School was T-shaped and was 35 feet to the eave line. Its 2-½ stories appear imposing, yet it was relatively small, at only one room deep and two rooms wide. Beyond the main entrance, which faced 3rd Avenue from the side of the short leg of the T, lay the central portion of the building which likely contained the hallway, stairway, and office space. The high basement implies the potential for usable rooms there as well. The brick exterior is simply detailed with large windows and a stone-edged gable parapet. Although the attic area is high and contains striking triple windows, the space was probably not used or even finished. Old Lincoln school, the only pre-1900 school building that remained in Rock Island until 1912, had a similar spacious but unfinished attic. According to the Sanborn information, Old Washington School did not have electric lights and was heated by stoves as well as a furnace. In 1888, only 79 students were in attendance here, while other Rock Island grade schools each had enrollments of 200-300 students. As the 1800s dwindled to a close, larger, more modern schoolhouses were built in Rock Island, among them Lincoln, Hawthorne, Irving, and Eugene Field. 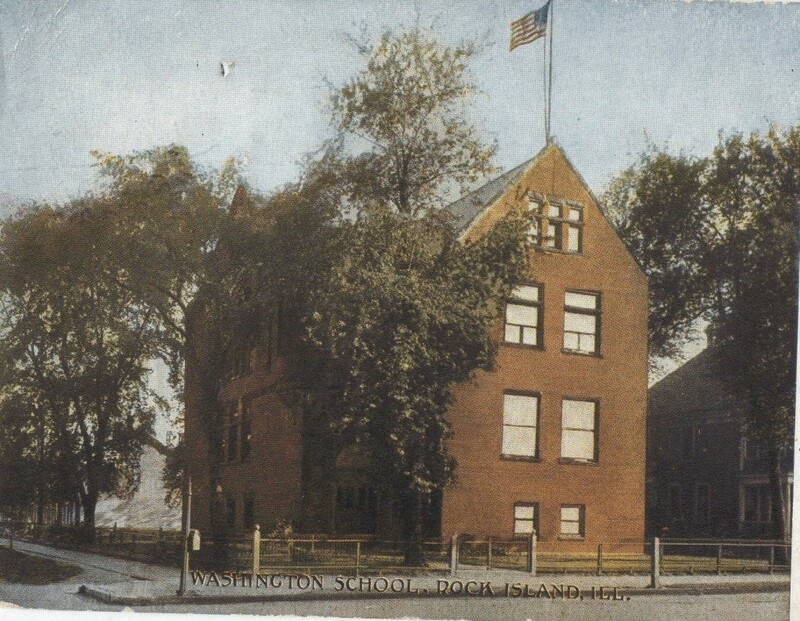 These newer schools occupied large lots, usually a square block, in contrast to Washington’s small corner site (note the proximity of the home to the right of the postcard. After Washington School was closed, probably in the teens, its remaining students transferred to Lincoln or Hawthorne Schools, but its name endured in a new Washington school on 18th Avenue at 33rd Street, the first school to be built south of 18th Avenue. Designed by architects Cervin & Horn, it opened in 1920 as a “departmental” grade school and was converted to a junior high in 1928. The original Washington School stood vacant for a time until falling to the wrecking ball by the 1930s. Today its lot holds a newer building, the home of a sheet metal company. This article, by Diane Oestreich, is slightly modified from the original, which appeared in the Rock Island Argus and Moline Dispatch on August 16, 2004.